The sanctuary was rich with the aroma of lilies this morning as the family gathered for a small private funeral. It was not the Easter of the crowded sanctuary and eager children. It was not the Easter of the organ and trumpet, bells and choir. It was the Easter of a family traveling the road towards Emmaus, from pain and confusion towards the presence of the risen Christ. The first word out of Jesus’ mouth when he appears to his followers in John’s Gospel is the word of peace. It is also the second word he speaks. We don’t have the normal “Stop being afraid” that we get with a heavenly encounter; we have the dominical word that does not simply offer peace but brings it. “Peace to you.” It’s not a wish or a hope, but the gift of the risen Lord. Peace eludes us. Not just in the face of death, but in all the stress and challenge of ordinary life. We are concerned for our children, concerned for our parents, concerned about work, concerned about finances, concerned about the care of the house, concerned for our health, our sleep, our future, our past. And whether we recognize it or not, we are concerned about matters of the spirit. We often think we are seeking happiness, but we are seeking peace. Wholeness. Connection. Meaning. A sense of harmony within ourselves and with the world around us. We are seeking peace. Shalom. Peace eludes us. But where we do not expect it, peace comes. In the breaking of bread. In the recognition of wounded hands. 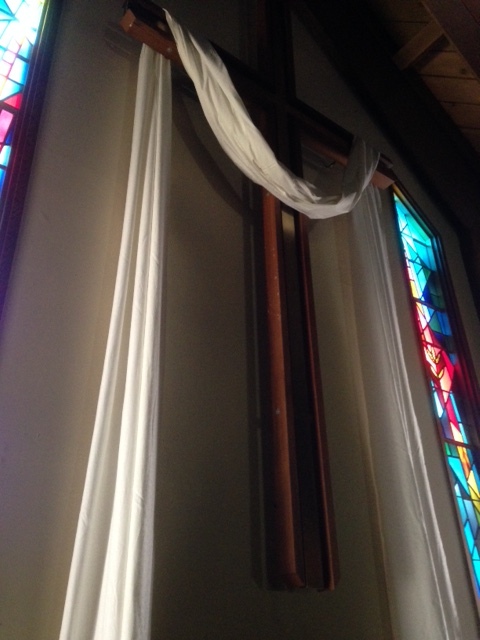 In the presence of the risen Christ. In the breath of the Holy Spirit. Where we do not expect it, peace comes. In a quiet sanctuary and the scent of lilies and the paschal candle burning: Christ the risen one, Christ the light of the world, Christ the light in my darkness, Christ the wounded one, Christ the living one, Christ who gathers us into his peace. This is where I wanted to linger. There is a shadow side to this authority. If we don’t speak it, who will? A therapist can help us accept and live with our past, but they cannot forgive it. A judge can assign a penalty, but when that penalty is paid it does not relieve us of guilt. Time and forgetfulness can sometimes help, but they bury wounds they don’t heal them. Christians are a unique people on earth, authorized to speak on God’s behalf. Of course, we have this terrible habit of claiming to speak on God’s behalf on a wide range of topics from gun control to parenting to international politics that God has not authorized. It would be helpful if we would stick to the message we were given. But this is the point: we have been given a very specific task: to release people from the burden of their sins. No one else in life can do this. Family and friends can love us. They, themselves, can forgive us. But they cannot speak for God. On this matter we can. On this matter, we must. Such an awesome authority and responsibility. And such a difficult task – for forgiveness isn’t cheap. Forgiveness is not permission. Forgiveness doesn’t mean that our words and actions haven’t harmed. Forgiveness doesn’t mean there aren’t wrongs to be righted. Such a message would be simple, but without power. The message with which we have been entrusted is that our debt towards God is lifted. The barrier between God and ourselves is torn down. New life stands before us if we will enter. The accusing voice of the law is silenced. Eyes shuttered against others by fear, greed and guilt are released. Closed ears are opened. Those crippled by shame or guilt are summoned to rise, take up their pallet and go home. This is the ministry we are given. This is the life towards which we point. This second Sunday in the Easter season always takes us to the story of Thomas. He was absent that first Easter evening when Jesus appeared to his followers as they hid behind locked doors. 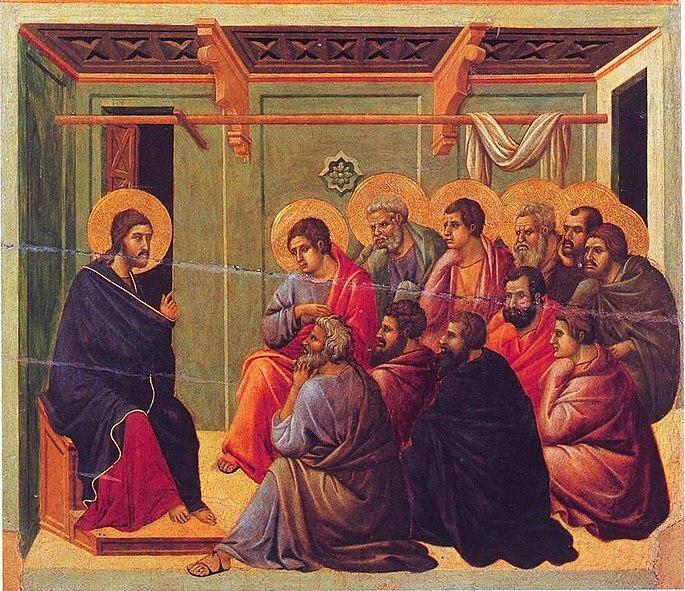 Thomas becomes an example of those who have not seen the risen Jesus and must decide whether to trust the apostolic witness. We tend to hear this as an individual struggle between doubt and faith. And because we tend to hear faith as believing ideas rather than trusting a person, we often miss that the drama in this narrative is not only the relationship between Thomas and Jesus, but between Thomas and the community of believers. It’s not simply that he doesn’t believe Jesus has been raised – he doesn’t trust them. He doesn’t accept their testimony. We tend to think it as honorable to want to see for ourselves. It’s good to see proof, to not follow the crowd. But this is not a nameless crowd; these are sisters and brothers in Christ. Even we understand that allegiance to family involves trusting what they tell us. Thomas is not wrestling with an intellectual problem; he is wrestling with whether or not he is part of this community. 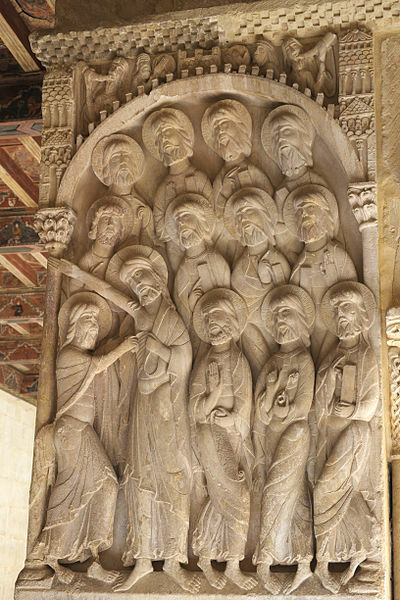 Though we think of this as the story of “Doubting Thomas”, this theme of the community is present at the beginning of the narrative when Jesus speaks his word that brings peace, and breathes on them the Holy Spirit/Breath of God. They are commissioned to exercise the authority of Jesus to declare the forgiveness of sins. And our psalm on Sunday declares, “How very good and pleasant it is when kindred live together in unity!” The word ‘kindred’ may not have quite the same emotional impact as ‘brothers’ (and sisters), but it is a psalm of ascent, a communal song of the believing community as they journey to Jerusalem for worship. It conveys the vision of a world enriched and enlivened by a deep and fundamental harmony in God. In this same vein, 1 John speaks of our ‘fellowship’ with the Father and the Son and with one another, echoing all the language and imagery in John’s gospel about Jesus abiding in the Father and he and the Father abiding in us. So the texts this year point us not towards Thomas’ personal struggle to believe, but to the work of God to form a community shaped and govern by God’s Spirit – a community bound together in love, a community shaped by the one who washes feet. 27Then he said to Thomas, “Put your finger here and see my hands. This translation “put your finger here” is perfectly fine, but I think it misses something sweet and important in the text. The Greek word is usually translated ‘carry’ or ‘bring’, suggesting something more like “Bring your finger here.” “Bring that here” can be no less a harsh command than “put it here”, but here the word ‘bring’ seems to involve the drawing near of the person, not just the object – it is Thomas who is being called to Jesus, not just his finger. In the same way, Jesus doesn’t say, “reach out your hand” but “bring your hand and put it in my side.” Thomas is being drawn to Jesus; he is not being subjected to proofs. This encounter with Jesus is, after all, not an exercise in rational thought; it is a summons to trust. It is a shame we translate the Greek words here as ‘doubt’ and ‘believe’. I cannot help but think our modern sense of those words distorts the message of the text. The word translated ‘doubt’ is the negative prefix ‘a’ with the word for faith. It works like the pair of words moral and amoral. The words here are ‘with faith’ and ‘without faith’, faithful and faithless. The issue is not whether God can raise the dead. The issue is whether the testimony of the disciples will be trusted – whether the voice of Jesus carried into the world by his followers will be trusted. Thomas didn’t trust it. It is no small thing to refuse the message spoken from God through his agents. It is like the president of Botswana saying to the U.S. Ambassador, I won’t trust a thing you say unless your president shows up and tells me himself. Such a response is likely to antagonize the president. In the ancient world it would make the king your enemy. It is an affront, a curt rejection of the king’s appointed representative and so a rejection of the king. But Jesus responds with grace, not wrath. He comes for Thomas, not to defend his pride. He comes to draw Thomas to himself, not to elevate himself. He comes that Thomas may ‘see’; see not just the scars, see not just that this Jesus is the same Jesus he had known, but to see the truth of Jesus. See like Nicodemus should have seen. See like the blind man or the woman at the well. See the divine glory present to the world. See the way and the truth and the life. These are not abstract concepts; they are personal. Thomas speaks not of ideas but a relationship: “My lord and my God.” He is no longer faithless; he is faithful.